therefore first introduces the philosophy of data communications covering signal propagation and information encoding. It then proceeds to cover various technologies, OSI model, protocols, network architecture, internetworking concepts and TCP/IP. 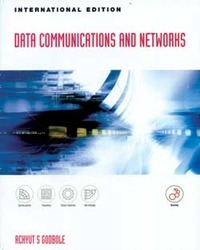 All this makes the book ideally suited for the first course on Data Communications and Networking. Salient Features: Unique introductory chapter describing various components of a communication system followed by an outline of the book in relation to this gives a clear idea to the reader about where and why of the placement of topics inside the book; independent, contemporary and comprehensive coverage of various protocols including OSI, ATM, Frame Relay, TCP/IP, ISDN and X.25; four chapters devoted to TCP/IP also covering TCP/IP, ARP, RARP, ICMP, TCP, UDP, DNS, EMAIL, FTP, TFTP, WWW. HTTP and TELNET; exclusive chapter on Multimedia Communications; four useful appendices on lpv6, Hardware for error detection, Network management and monitoring, and Fundamental mathematics for problem solving; pedagogical features: Summary and Key Terms at the end of each chapter, 576 objective-type questions including true/false and multiple-choice type quizzes, 266 review questions and practice exercises, over 340 figures providing the text a visual approach.